Why does A-Camp cost so much? Adult camps became a big business since about a year after we started ours, with ours remaining the most affordable event of its kind. However — much like other LGBTQ websites! — we’ve seen most of these camps shutter in the past several years, with the most successful of the bunch (Camp No Counselors) going spectacularly bankrupt. It’s expensive to run an adult camp, and for us, there’s the added factor of A-Camp being invented initially as a way to support Autostraddle. II. Because It Costs So Much To Do! We rent an enormous facility, provide world-class talent & entertainment, and bring our own staff of 60+ people from around the world to make A-Camp happen. We also take feedback from campers seriously, and making each camp better than the last often involves a larger financial investment. So, let's talk about those costs. This is our largest expense by far, as we are leasing an entire property and providing meals and lodging for 300-425 staff and campers. Housing at Beber Camp was 40% more expensive for campers than it was at Alpine Meadows, but that facility didn’t meet our expectations, and we returned to California for better weather and a site we could really trust to deliver a solid experience. 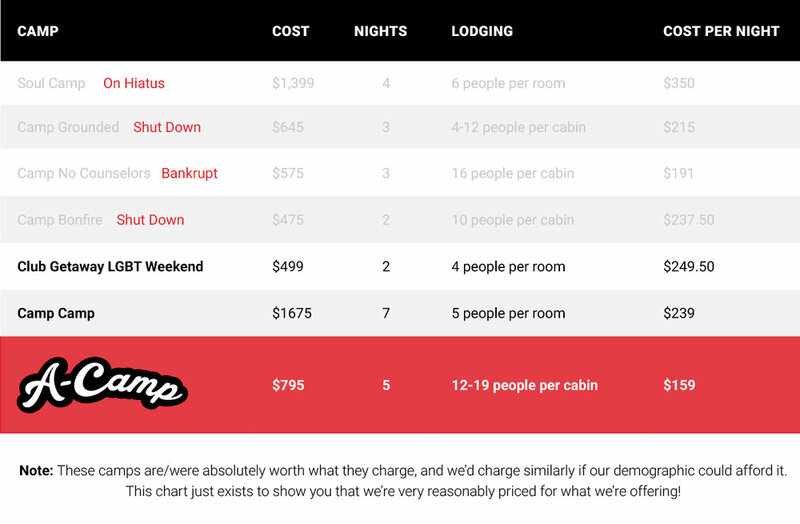 We had to face reality: a premium camp experience is going to be way more expensive — 48% more expensive than Beber. But everybody agreed last year that the move was worth it. We cover travel expenses and lodging/meals for a team of about 60 people from all over the continent. We also have 13 staff positions who are paid small stipends for their work with A-Camp, ranging from booking shuttles and travel to consulting on trans issues. Our Two Co-Directors Marni and Kristin work between 20-60 hours a week in the months leading up to camp, with the last month being a full-time job. This kind of intensive and temporary contract work is a difficult job to fit into a career, but they do it and are compensated accordingly. We bring in 4-6 featured talent every camp and they perform for y'all at a teeny-teeny-tiny fraction of their typical rates (BECAUSE THAT'S HOW MUCH FUN CAMP IS!) We also often bring in facilitators with specialized skills for specific programming — sometimes for free, sometimes for free/discounted camp or a stipend or travel expenses or some combination of those. In order to provide a diverse team, a wide range of programming options, and provide every cabin with two counselors, A-Camp requires a staff-to-camper ratio of about 1:6. 40-50 unpaid non-leadership staff members work their asses off leading workshops, supporting campers, and helping behind-the-scenes. Making A-Camp accessible to people of various ability levels requires expenses like golf cart and van rentals (and insurance) or sign language interpreters. We offer 100+ workshops and activities throughout camp, many of which require extensive supplies. There are lots of random expenses, too, like signage, A/V equipment, bins for food storage, step-and-repeats, and bandanas for the rainbow wars. At the Ojai site, we also have to rent and bring in our own stage. A-Camp was initially designed as a way to support Autostraddle.com, the site that birthed A-Camp, as digital ad revenue has declined every year since 2013 — for many years, we all worked at camp for free and most covered their own travel. We're glad those days are over and that the growth of our membership program A+ has enabled us to be not entirely dependent on A-Camp profits to stay afloat. But it hasn't eliminated the need for profit altogether and remains a crucial revenue stream. Furthermore, the time, energy and money that the site loses as our staff prepares for and attends A-Camp is significant and therefore must be "worth it." Many team members take time off their paid jobs to work at A-Camp, partially 'cause they know A-Camp profits enable their Autostraddle paychecks. But also BECAUSE IT'S SO FUN. We wanna give you a really good camp! A relatively small price bump per-person can make a huge difference in what we're able to offer. Ask anybody at A-Camp 6.0 about the Taco Truck and they will attest that this is true!